This page contains reviews of science and religion books that Latter-day Saints may find interesting. Each review is divided into three sections, book summary, details, and recommendation. I have read the following books in their entirety. 8. Mormons and Science: Setting the Record Straight, by Professor Rodney J. Brown (Brigham Distributing). The Gist. Discuss the relationship between gospel teachings and science. The Details. This book covers a wide range of topics as it explores the relationship between the teachings of the Restoration and science. Issues include the scope of Mormonism, the scientific method, search for truth, scientific history, and evolution. Recommendation. I concur with the book’s main premise which is that gospel truth and true science always agree. Unfortunately Professor Brown does not explore the issues at a deeper level that is warranted. As such the book reads more like an introductory pamphlet which does not come close to “setting the record straight” as the title suggests. 1. On page 4 the author claims that it is easy to balance scientific theories with LDS theology, but then the discussion turns to the facts of science agreeing with our theology. The facts of science are not the same thing as scientific theories. Scientific theories are generalizations or attempts to explain the facts of science, as such they are subject to correction and refutation. It is not always easy to balance scientific theories with LDS beliefs. The gospel is perfect; scientific theories are not. 2. The historical discussion on rationalism and empiricism (p. 10-11) has a huge gap in it. The author correctly attributes the rise of rationalism to Socrates and Plato (circa 400 BC) and then jumps all the way to Newton (circa 1700 AD) to discuss the rise of empiricism. However, the most important figure in the history of science that deserves credit for popularizing both rationalism and empiricism (the 2 pillars of science) is Aristotle (350 BC). And if you asked any historian of science to mention a pivotal scientist from the modern era who popularized empiricism, it would more than likely be the father of modern science, Galileo, not Newton. 3. Throughout the book the author describes the scientific method as being rooted in Karl Popper’s principle of falsification. In all my study of the philosophy of science I have not seen the traditional scientific method equated with popperian falsificationism. 4. The discussion on evolution on page 32 leaves the reader hanging, wanting more. I think that someone who is the dean of the BYU Dept. of Life Sciences would have much more to say about the relationship between evolution and Mormonism. 5. As is typical of many biologists and earth scientists in academia, the author gives a false representation of Intelligent Design (ID). 6. On page 44 the author introduces Aristotelian physics but does not provide a description of what that physics is. Finally, given that Mormons and Science: Setting the Record Straight is big on direct quotes (of which a couple are repeated: p. 18-19 & 33; 27 &31) but small on original insight and discussion, I think a more appropriate title would have been Mormons and Science: A Brief Introduction or Mormons and Science: A Collection of Interesting Quotes. However, these titles would have been problematic as this book was written for a “Setting the Record Straight” series. With all due respect to Brigham Distributing, you cannot set the record straight on science and LDS theology in a mere 55 pages, of which half are made up of direct quotes. 7. The Case for Divine Design: Cells, Complexity, and Creation, by LDS author Frank Salisbury (Cedar Fort Books, Inc.). The Gist. Present biological, genetic, and biochemical evidence supporting evolution and then question whether that information disproves intelligent creation. The Details. The author begins with a chapter on gaining knowledge by science and faith. Subsequent chapters 2-6 discuss the evidence supporting evolution. In chapter 7 Salisbury brings everything together and discusses whether the evidence negates or is consistent with a divine creator. Recommendation. A lot of useful information is presented, but it may not be accessible to those without a little background in basic biology. You will have to wait until the last chapter to read about how all the information he presents ties in with a Gospel understanding of the creation. Mr. Salisbury has extensive study and research experience in evolution and biology. He knows what he's talking about and clearly comes down on the side of divine, purposeful, and directed creation of humankind. This book is recommended for biology-informed folks. These people will find it very interesting. The Gist. Collins shares his beliefs about the origins of the world and life in this book. He believes that there is sufficient evidence in genomic research to suggest that mammals (including humanity) evolved from a common ancestor. However, there is also conclusive evidence for the existence of God; this evidence includes the internal moral code that exists in most people, and humanity’s enduring desire to search for deity. The Details. Collins begins by discussing the current war-like debate between believers and non-believers in science. He criticizes radicals from both sides – those who emphatically assert that there is no God and those who emphatically assert that evolution is false. He also delves into his conversion story and how he was deeply influenced by the words of the christian philosopher CS Lewis. Next he gets into the scientific evidence in favor of evolution, particularly evidence from genomic research. He tries to point out to believers that accepting evolution is the rational thing to do. He also takes a swing at young-earth creationism and the Intelligent Design movement. Then he changes direction and points to evidence suggesting that believing in God is rational. He buttresses his argument in favor of God by pointing out the irrationality of the Galileo vs. Catholic Church struggle, and the irrationality of atheism and agnosticism. He then proceeds to present his version of a harmonious synthesis of religion and science, a position he calls Theistic Evolution or BioLogos. He would like to have used the name Intelligent Design, but that title has already been co-opted by another movement that embraces some ideas he does not agree with. The essence of Theistic Evolution is that all life evolved from a common ancestor in accordance with God’s will. He even discusses some counter arguments from believers who reject the idea that God used evolution to create man, to support his views. Recommendation. I recommend this book to Latter-day Saints. Here is a world famous scientist telling the world how he came to believe in God, and he encourages others to do the same if they have not yet done so. His motive is not so much to bring souls unto God; his motive is to decrease the conflict between science and religion by helping atheists and agnostics find their way to God. 5. Divine Engineering: Scriptural Accounts and Scientific Truths about the Earth's Creation are Compatible, by LDS author David N. Brems (published by Cedar Fort). The Gist. Discoveries in science are compatible with scriptures and teachings in the gospel. The second half of the book is more speculative than the first half. This is where he attempts to reconcile the gospel with (a) the historical record of the sequence of life arriving on earth; (b) discoveries in molecular biology; (c) the supposed ancient age of the earth; (d) science’s approximation for the arrival of homo sapiens (humans); (e) the fossil record; and (f) evolution. I found the chapter on the age of the ancient earth to be especially interesting. He says that the earth is 7 thousand years-old in years reckoned after the Lord’s time. If one of God’s days = 1000 of our years, then that makes the earth several billion years-old by earthly standards, a number, he says, that agrees with modern science. He also points out that prior to the Fall, time was reckoned according to the Lord’s time. Abraham 5:13 says that, before the Fall, time was reckoned after God’s calendar (an idea consistent with the notion that the earth was in the presence of God near Kolob before Adam fell). This supports his assertion that the creation lasted much longer than previously thought. Recommendation. Members who are looking for a true-to-science interpretation of creation accounts in the scriptures will find this book very interesting (recommended). Members who put scriptural accounts of the creation before scientific accounts will, in all likelihood, not enjoy this book (not recommended). For example, members who accept a young earth, believe that fossils came from other worlds, reject pre-Adamic Hominids (cavemen), and reject the Big Bang, will be frustrated with reading an LDS scientist who, they feel, is trying to get them to change their minds. I found several parts insightful and learned some new perspectives on these issues. However, the book reads more like a brief treatise than a thorough discussion on the main issues. At times it seems to lack substance given there is no central theme or story line holding everything together. So the book is tough reading at times, but the short chapters help with this. I have concerns with some overly ambitious claims. Here is a sampling: (a) “The sequence for the introduction of life forms [as presented in the scriptures] is totally consistent with the scientifically derived historical record,” (b) “Science shows the earth had a definite origin referred to as the big bang while the scriptures refer to this event as, ‘In the beginning.’” (c) A careful examination of the scriptural versions of the creation is fully consistent with veritable evidence from modern science.” These comments are overly ambitious. More importantly, though, they put complete faith in the veracity of scientific claims. Caution is needed when claiming that the gospel supports scientific discoveries, especially given that science is continually evolving and changing its theories. One final note: the chapter on evolution is bang on! It is refreshing to hear an accomplished scientist take a stand against macroevolutionary dogma. 4. Rock of Ages: Science and Religion in the Fullness of Life, by Stephen Jay Gould (published by Ballantine). The Gist. Rock of Ages presents Gould’s conception of NOMA – Non Overlapping Magesteria. Gould identifies science and religion as two separate magesteria (domains) that should not overlap. Science is the domain of empirical fact finding about the natural world, and religion is the domain of faith in a supreme being which teaches moral principles. The Details. The principle of NOMA is quite simple. Both science and religion are beneficial to humankind. Each should be allowed to operate without undue influence from the other. Think of NOMA as the relationship between the legal and medical fields. A lawyer should not meddle in the everyday workings of a physician, and a vice versa. By respecting and not usurping authority the other domain, science and religion can live in relative harmony and peace (an endeavor he calls “irenics” which is “peace” in Greek). It should be noted that Gould’s NOMA is not a reconciliation or synthesis of religion and science, rather it is a separation. Gould makes the case for NOMA through the book, citing examples of violations and adherence to NOMA. I especially like the way he incorporated religious examples into the text. Doubting Thomas is one example. Thomas inappropriately applied the principles of science in a religious domain. Rather than accept the testimony of others and have faith in the reality of the resurrected Lord, he claimed that he would not believe until he saw the Savior with his own eyes. In other words he demanded empirical (scientific) evidence in a religious domain. Gould then gives an example of a scientist who unreasonably applied religious faith while describing the creation of the earth. He lauds the Catholics, and Pope specifically, for embracing the principles of NOMA, and he criticizes theists who believe that “God must arrange the facts of nature in a certain set and predetermined way.” The Catholics are consistent with NOMA because they allow their doctrines to align with theories like evolution, and theists are in violation of NOMA because they are generally inflexible when it comes to accepting controversial theories. As I point out in Truth and Science, the relationship is much more complex. Science and theistic religion make assumptions about the world that cannot just be brushed aside, and many believers who are also scientists cannot simply compartmentalize religious and scientific beliefs that are at odds. Like myself, they yearn to find a way to reconcile truth claims from the two domains. Their desire to find a reconciliation necessarily brings doctrines from the two domains into contact, thus violating Gould’s principle of NOMA. So, in my opinion, NOMA hinders a healthy comparison and dialogue of interrelated religious and scientific issues. Moreover, I feel that NOMA requires more concessions from religion than it does from science. For example, Gould urges theists to compromise some of their views of the creation and accept, as do the Catholics, evolution in all its forms. Scientists, on the other hand, are urged to avoid making value claims and stick to the facts of nature. Now which group is required to make a larger sacrifice? That’s right, the believers. 3. Earth: In the Beginning, by Eric N. Skousen (published by Verity Publishing). In this information-packed book Eric N. Skousen (son of Cleon Skousen) discusses the creation of the earth and the origins of life. Throughout the book he compares what science says about the creation and compares it with gospel teachings. The approach is one of attempting to reconcile scientific discoveries with gospel teachings. In a few cases (e.g., evolution from a common ancestor), he openly rejects scientific accounts that are at odds with gospel teachings. The book divides the creation into three epochs: (1) the spirit creation; (2) the physical creation; and (3) bringing modern life to earth. There are also nearly 100 pages of appendixes on the scientific method, intelligences, comparison of creation stories, radiometric dating, and scientific creation eras. Skousen devotes attention to several issues not of concern to science such as the Fall, God’s cosmology and time, creation of the spiritual earth, agency, events in the Garden of Eden, and the celestialization of the planet earth. These spiritual issues make the book more than work comparing religious and scientific viewpoints. Skousen attempts to explain the creation in a manner consistent with the basic doctrines of the restored gospel, so readers don’t have to worry about reading something that challenges their testimonies. By showing how scientific discoveries and Restoration doctrines can be reconciled, his goal is rather to strengthen testimonies in the restored gospel. There are plenty of scriptures and quotes from latter-day prophets and apostles to support his ideas. Nearly every section contains interesting facts and perspectives; there are too many to give an adequate sampling. One thing I found personally enlightening is his explanation about why Adam and Eve had to transgress to bring about the Fall. Skousen asks a question that I have asked for several years: “[W]hy should the mechanics of the Fall require Adam and Eve to disobey the Father?” Skousen’s brilliant answer, and one which eluded me, is that “The Father had to bring about the Fall without being personally responsible for it.” He will never do anything to push His children away from Him, yet the Fall had to happen. In my opinion, this is a brilliant answer and I accept it as correct. Many readers will surely find other interesting insights. As long as the reader remembers that the book contains speculation, there should be no qualms about reading intriguing and unproven ideas. For instance, regarding the spiritual creation of our earth, Skousen says “it is reasonable to assume that [the] nurturing waters resided on [a] resurrected parental planet of the earth. . . . Within [a] watery womb.” He is saying that our earth’s spirit was born from the womb of a mother earth. Some readers may find this very unusual, but at least he mentions at the onset that “it is reasonable to assume,” letting readers know that we cannot be certain about the circumstances surrounding the creation of the spirit earth. I recommend this book to people interested in reconciling religious and scientific ideas surrounding the creation of the world. It contains a lot of information. People who enjoy this book will likely hold onto it as a future resource. 2. Joseph Smith as Scientist: A Contribution to Mormon Philosophy. Written by Elder John A. Widtsoe, 1908 (currently published by Archive Publishers in Grantsville, Utah). Book Summary. The main purpose of this book is to show how teachings of the prophet Joseph Smith predate and are consistent with scientific discoveries during the 1800s. 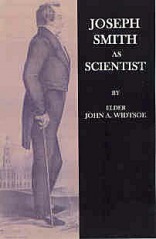 Elder Widtsoe also uses the teachings of Joseph Smith to shed further light on the 19th century scientific understanding of mankind and the natural world. Details. The title is a bit misleading. I am sure enemies of Joseph Smith would not hesitate to criticize the prophet for claiming to be a scientist or accuse him of being a very poor one, given the opportunity. But as Widtsoe points out on page 16, “Joseph Smith was not a scientist,” nor did he pretend to offer solutions to the scientific questions of his time. His mission and teachings were spiritual. Nevertheless, as the reader discovers in this book, several of his spiritual teachings have relevance to our understanding of scientific discoveries. Although some of the material in this book is dated given that it was first published 100 years ago, much of the content is contemporary in nature. By contemporary I mean that much of the material is just as relevant today as it was 100 years ago when Widtsoe put pen to paper. He covers issues in physics, astronomy, geology, and evolution. In physics Widtsoe points out the similarities between scientists’ discovery of the indestructible nature of energy and Joseph Smith’s teaching that intelligences can neither be created nor destroyed. Joseph Smith taught this doctrine 15 to 20 years before conservation of energy was largely understood and accepted by the scientific community. I particularly enjoyed his chapter showing how the prophet’s teachings of a law governed universe and a divine lawgiver is consistent with science’s claims of a world governed by universal laws. He also discusses how miracles exist in a law-governed world. Reconciling supernatural events in a law-governed world continues to be a relevant issue for scientists who believe in God. In his chapter on astronomy Widtsoe points to the similarities between the prophet’s lessons on the Lord’s numerous creations and science’s claim that the heavens contain innumerable worlds. In the section on geology, he emphasizes the similarities between geological claims that the world has existed for millions of years, and the creation story in Joseph Smith’s translation of the Book of Abraham which suggests that the days of creation refer to long periods of time. Interestingly, Widtsoe admits that the creation account given in the Book of Abraham is about the spiritual creation of the earth, but states that he believes that the “spiritual account is a perfect account of the material creation” (footnote, p. 59). On the matter of evolution, Widtsoe’s views demonstrate insight and wisdom. When he wrote this book evolution was a relatively novel idea. Charles Darwin published his Origin of Species just a few decades earlier in 1859. Widtsoe basically denies that science has proven beyond doubt that all life forms, including mankind, evolved from a common ancestor. In other words, he rejected what has come to be known as macroevolutionary change across life forms. He does, however, agree with microevolutionary change within species and points out that this type of evolution has been clearly demonstrated by science. He goes on to compare this latter form of evolution to the doctrine of eternal progress taught by Joseph Smith. In other chapters, Widtsoe draws parallels between science and faith, repentance, baptism, and the Gift of the Holy Ghost. A chapter that will concern some readers is chapter 4 on the theory of luminiferous ether. Ether is a substance that was once believed to fill ‘empty’ space throughout the universe. Widtsoe claims that ether is a manifestation of the Light of Christ which Joseph Smith taught permeates all of God’s creations. He also states that “The existence of the ether is a certainty of science” (p. 23). Well, the theory of luminiferous ether is no longer accepted by the scientific community; it has largely been debunked. Lest we become too critical, it is important to remember the historical context in which Widtsoe wrote this book – ether was widely accepted as a legitimate scientific theory during the late 1800s. It is also conceivable that a theory similar to ether will rise to prominence once again as scientists learn more about energy in the universe. Recommendation. I recommend this book. There are interesting ideas that made me pause and think about issues in a new way. Other ideas strengthened my beliefs about the relationship between LDS theology and science. Although some of the issues are somewhat dated, reading this book gave me a feel for how early LDS scholars like Widtsoe viewed science during an exciting time of rapid discovery when new ideas about the world and universe were coming to light. 1. 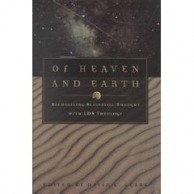 Of Heaven and Earth: Reconciling Scientific Thought with LDS Theology. Edited by David L. Clark, 1998 (Published by Deseret Book). Book Summary. Of Heaven and Earth, an edited book by David L. Clark, contains several articles by LDS scientists. Some of the articles were written for this book while others were drawn from extant works. The general format for most of the articles is commenting on discoveries and personal scientific work and discussing how these are consistent with the doctrines of the Restoration. Details. Four chapters that I found particularly interesting were one, two, nine, and ten. In chapter one, Philip F. Low draws some interesting parallels between the gospel and science. He points out that both involve uncertainty and require faith, that both require a valid method for uncovering truth, that the gospel and scientific discoveries are consistent in many areas, and that scientific discoveries affirm some of our religious beliefs. In chapter two Bart J. Kowallis discusses the issue of whether religion and science are separate and compatible enterprises. His discussion focuses on the creation of the earth, astronomy, and evolution. He does a good job of pointing out that many of the misconceptions between science and religion arise when we forget the purposes of each. Science was never intended to bring souls unto Christ, and scripture was never intended to be used as a science textbook. In chapter nine B. Kent Harrison discusses knowledge and the ways to acquire truth in science and religion. He also delves into the issue of reconciling scientific and religious beliefs and points out the disparate aims of each. In chapter ten De Verle Harris discusses the correct problems to research, asking appropriate questions, properly prioritizing our need to come unto Christ, and compares religious and secular perspectives on the environment. Recommendation. I do not recommend this book to everyone. People who are interested in the earth sciences and know the authors may find it interesting (a limited audience, mind you). As someone who is interested in broader issues dealing with science and the gospel, I was somewhat disappointed. First, some of the authors present specialized knowledge that is difficult for readers to understand. For instance, statements like “My first assignment was to synthesize a chemical precursor of purines, 4-amino-5-imidazolecarboxamide” and “The principle of multiple working hypotheses, for example, has an analogue in Bayesian probability theory in which at the completion of each successive stage of investigation the geologist revises his previous a priori probabilities for each hypothesis to a new a posteriori probability, based on his geoscience (expressed as conditional probabilities for geological features, given each hypothesis) and on the existing and newest geological information.” Are you still with me? I assume you understand the problem here. In my opinion writers should not introduce specialized concepts to readers unless they are willing and able (given space limiations) to explain the concepts in a clear and concise manner. If there is not enough room to provide an adequate explanation, and if the concept is not important enough to devote text to, then leave it out. Second, too much text is devoted to mundane issues such as where the authors went to school, where they served their missions, and who they married, to give a few examples. Now my intention is not to downplay the importance of these events to the authors, but when the individual sharing the information is someone you have never heard of before, it just comes across as fluff. The exception, of course, is the chapter by Henry Eyring. He is famous and well known, so naturally I was interested in his ordinary life. But I had never heard of the other authors before reading this book. It is difficult to achieve cohesion and continuity in edited books; this is exactly what this book lacks. It reads like a bunch of articles haphazardly put together. If there had been more planning and focus in the chapters along with ongoing commentaries and a wrap-up chapter at the end, Of Heaven and Earth would have been more appealing.